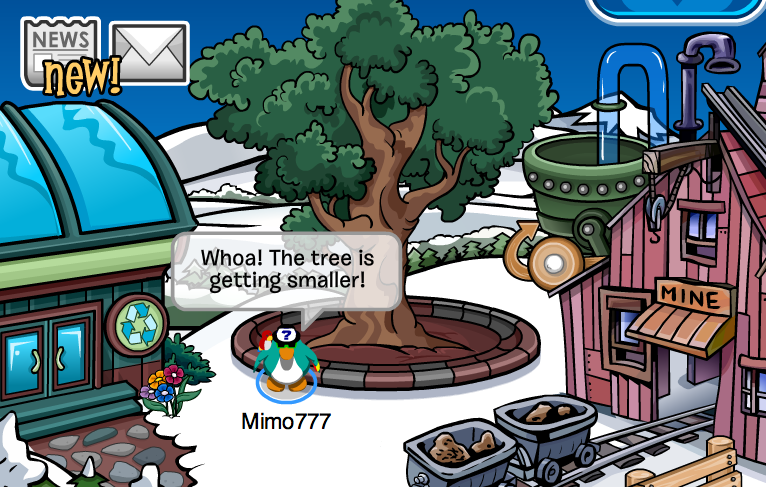 Club Penguin Cheats by Mimo777 Club Penguin Cheats by Mimo777: The Shrinking Club Penguin Tree! Noo! Now we'll never know if its gona grow Twinkys or shoes! Who put plant shrinking substances in their watering can? Wow. Who would've expected that. PS. There is a new update on the main page of club penguin. nothing special but I thought I might tell you. Hmm... maybe it will gorw big, then small, then big, and then small again. So it would be always changing. Weird? I think it';; grow back, Hey Mimo, I have a question, when it says posted at 10:52 or whatever time a post was posted at, is that the real time from where you live? Wow. Just unbelievable. Maybe everyone is working so hard to get the stamps the they forgot to water the tree or something! Wow. Will put some more of those cheats or tips to help ya out! I have a suscspison who is behind it, a certain bear, and a certain crab, that only elite penguins know of. I recon people haven't been watering the tree! is it just me or has anyone been losing connection while logging in alot ? Noo! Now we'll never know if its gona grow Twinkys or shoes! Who put plant shrinking subtances in their watering can? If you click the starfish on CP main page, it turns into different things. The tree will shrink and the mountain for the mountain expedition will appear. Not that hard to figure out. I think it is becoming smaller because winter is coming. Oh my gosh! Nonmembers cant even buy a blue or red puffle now! It is a glitcht though. I really need that fixed! Woah your account should be glitched or something. Or CP didn't update the game on the server that your on. Still WIERD! Just go to the Recycle Plant and RECYCLE!!! I think we can save the tree buy recycling only!!!!!! I am not sure about this because I am now posting this comment at 10:52 aswell (Well thats what it says on my clock) But I think that it is the time that Blogger uses. Deat Mimo777 I Have Found A Glitch! Go Into The VR Room And Click the 2007 button then look where the dojo courtyard should be! i dont get it! the dojo courtyard came out in 2008!!! Heights! Camera! Action! Have you scaled the true altitude of the mountain yet? I hear there’s a special memento for you to document your adventures! I think in a few years club penguin will not be worth playing if you are not a member the way club penguin is going you have to pay for everything! Sorry for all you none members i will post a comment on everything that happensd in the mountain expedition! I think the tree's shrinking coz autumns coming soon and it's losing it's stuff like a tree that loses his leaves. I am sorry if i have spelled some words incorrectly, i am from Romania and i don't talk English everyday! So, i hope you enjoy the list! Puffle Rescue stamps were here a few days ago but Club Penguin must have removed them. I think the tree is shrinking because its gonna be december in a couple months. So.... that my mean its shrinking because its gonna be winter so it won't die lol!